The hackings continue, but who is to blame? It's more than a week now since the first media reports indicating that Uber customers from all across America have been complaining of rides being fraudulently charged to their accounts – including, among others, a North Carolina woman who couldn't possibly have taken Uber rides through various neighborhoods in London, England. And it's been a month and a half since Vice magazine's Motherboard blog first discovered that Uber accounts belonging primarily to users in the U.K. were being sold for as little as $1 apiece on a cybercriminals' “dark web” forum. On the other hand, another Twitterer complained on May 1 that “@Uber wish there was a way to contact you guys.... No phone number and no one responds to my email. Very frustrating,” and “@Uber account has been hacked and charged almost $200. Uber has no sense of urgency when fraud has been committed. Still no email! 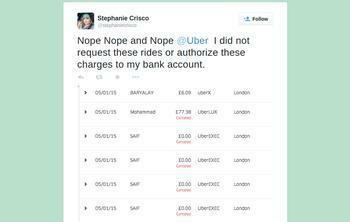 !” As of May 8, no responses from Uber are visible on that public Twitter feed. We contacted Uber seeking comment on the “hacking” allegations in general, and specifically about the driver's claim that Uber drivers who transport fraudulent passengers are “deactivated” even if they did not know the ride was fraudulent, but as of press time Uber had not responded to our request.